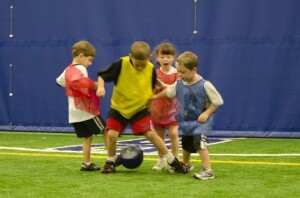 Branchburg Sports Complex is the most exciting party destination in New Jersey! 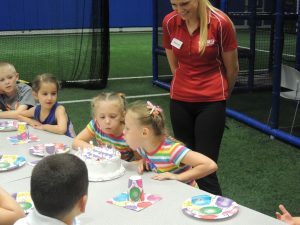 Our birthday party offerings range from sports-themed field parties to our unique, interactive laser tag experience! At BSC, we want you and your party guests to enjoy the day while we take care of everything! Your guests will enjoy an exciting, safe and clean party environment – you’ll be able to celebrate with your child while we do all the work and you have all the FUN! To request a party, fill out our Birthday Party Request Form and a party planner will be in touch with you shortly. “Spin the Wheel” – The birthday child gets a chance to win exciting prizes such as; gift cards, stuffed animals and tons of arcade tickets! Calling all sports fanatics: host your next party at BSC, the ultimate sports zone! Our indoor turf fields guarantee a great time, rain or shine! BSC will plan your games and provide all the sports equipment and staff to ensure you and your party guests have care-free, action-packed play time. Choose up to two activities to do on the field. Ask us about your favorite game! We set the stage for a fun and exciting Dance Party. Have a ‘Rockin’ good time as guests move to the music, incorporating today’s hits along with your child’s favorite songs! Age appropriate dances that incorporate music, such as the Limbo, Freeze Dance and much more. Make your little one feel like an All Star! 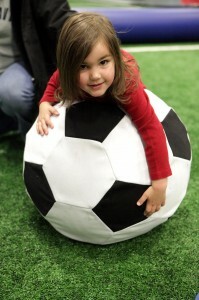 Step up to an exciting celebration for our littlest sports fans. Let our party specialists play age appropriate games and challenging activities to help your birthday child and their guests learn the fundamentals and skills to become the All Star they want to be! 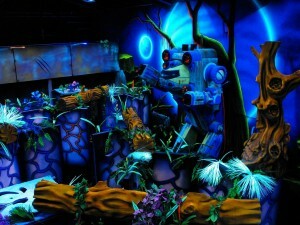 Branchburg Sports Complex takes laser tag to the next level! Our laser tag parties will take place in BSC’s exciting Family Entertainment Center, a 9,000 square foot interactive themed laser tag arena, plus an arcade area with a redemption. Our state-of-the-art laser tag center will be able to accommodate up to 80 players per mission. Laser tag parties at BSC are out of this world! Each BSC laser tag party includes two exciting unique missions. If extra vests are available, 2 adults may play with the party group for free. Laser tag party groups will be scheduled to play with other age-appropriate laser tag parties only. The BSC laser tag experience will transport you to an exciting adventure in our multi-level urban jungle-themed blacklight arena, where your mission is to find your opponents and tag before they tag you! Laser tag parties are fast paced, adventurous, and each one is a unique challenge. Our interactive viewing area is fun for siblings and parents too! Plan your child’s next dream party in our amazing PlayMaze! Our multi-level Playmaze will challenge and entertain your child with 82 different play elements including slides, tunnels and bridges. Our BSC PlayMaze is also equipped with a Parent Viewing Section which allows parents to keep a watchful eye while your child and their friends have a blast! A pair of socks and an imagination is all that’s needed for an aMAZEing time! Tod Squad Birthday Parties! They’re EXCLUSIVE! Children get to play, climb, bounce, explore and so much more all in a safe, fun environment. 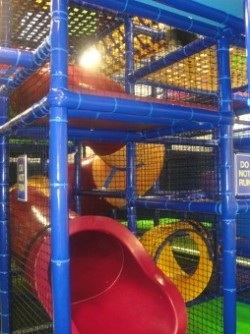 Activities include: special toddler bounce house’s, soft play equipment, PlayMaze, sports balls, toddler toys and more! 45-60 minutes of EXCLUSIVE TOD Squad FUN! 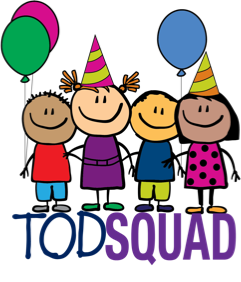 TOD Squad parties will be offered Tuesday through Friday at 11:00am, 12:00pm or 1:00pm on a first come first serve basis. All parties require a $100.00 non-refundable deposit in order for BSC to secure the dates and time. If a party must be rescheduled, the customer may do so one time without penalty 5 days prior to the event. The customer has one year from the original event date to reschedule their party. If the party is cancelled or rescheduled after confirmation is received 50% of the deposit along with the cost of any perishable items ordered will be forfeited. Please let us know of any food allergies at the time of booking. A head count is requested 5 days before your event. Manditory Waiver Policy: All guests are required to fill out a BSC waiver to participate in any activity at BSC. For guests that are under the age of 18 a parent/guardian must fill out a waiver. Waivers are available on our website and copies are available at our facility. We are unable to make exceptions so please make sure to remind each party guest to complete a waiver prior to the day of the party!